When you begin to seriously question all the things you can do, and things you can make with the Lavender that you grow in your garden, you know that you have truly fallen for this lovely plant. Growing Lavender plants means you can make Lavender oil! Making your own Lavender Oil from your plants is a question that many people ask how to accomplish. I will tell you about making Lavender Oil as well as give you a simple recipe below to extract Lavender Oil. 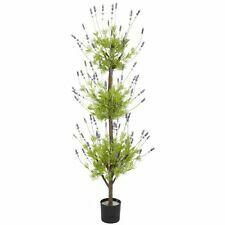 You will need fresh Lavender flowers which produce the best fragrance although you may also use Lavender plant trimmings such as the Lavender leaves and stems but avoid the old woody growth of the plant. Have about 2 - 4 cups of material. You may use scissors to cut the stems and leaves into manageable pieces to fit into the jar. Cut them about 1-2 inches long or smaller. a carrier oil which has a pale color and mild scent as to not over power the Lavender - You will need enough to fill the container almost to the top leaving 1/2 inch of free space and to completely cover the plant material. Place your Lavender into the glass jar and fill with your chosen oil. Put the lid in place and set the jar in a warm spot to "brew" shaking it periodically to mix. Allow to sit at least 48 hours although an extra day will not hurt the process. The Lavender Oil will be attracted to your base oil and create a Lavender infused oil. If you cannot find a suitable warm spot you may run a sink full of very hot water and then set the glass container in for a while refreshing the hot water as needed and shaking the container to mix the ingredients. You will still need to allow it to sit overnight. You will need to strain out the plant material using the strainer or cheesecloth squeezing out all the oil you can before placing more plant material into the jar. You will want to repeat this process 2-3 times or more until the desired strength of fragrance is achieved. Store your finished oil in the dark glass bottle in a cool dark place to preserve it's healthful properties. Your oil should last up to a year when properly stored. This makes a wonderful fragrant Lavender infusion that can be used for bath and body purposes such as massage or a lovely thoughtful handcrafted Lavender gift for a special person. This is not the same as pure Lavender Essential Oil made with the Steam Distillation process. Depending on your choice of base oil you may even use it for culinary (cooking) purposes or one of the Lavender Oil uses. Making Lavender Oil from plants you have grown can be a very rewarding experience. There are other methods for making your own Lavender Oil but they are not necessarily aimed at the home producer. They are better suited for the commercial Lavender growers and producers of large quantities of essential oils. These other ways are the Solvent Extraction method used primarily to produce Lavender absolutes and the extraction methods of Maceration and Expression. The Maceration method of extraction will work for the home grower but does not produce pure essential Lavender oil but a Lavender infused oil instead. Learn more about these other methods of extraction and the production of essential oils. Diffusing Lavender Oil makes a room smell great and is healthful cutting down on germs and airborne viruses.